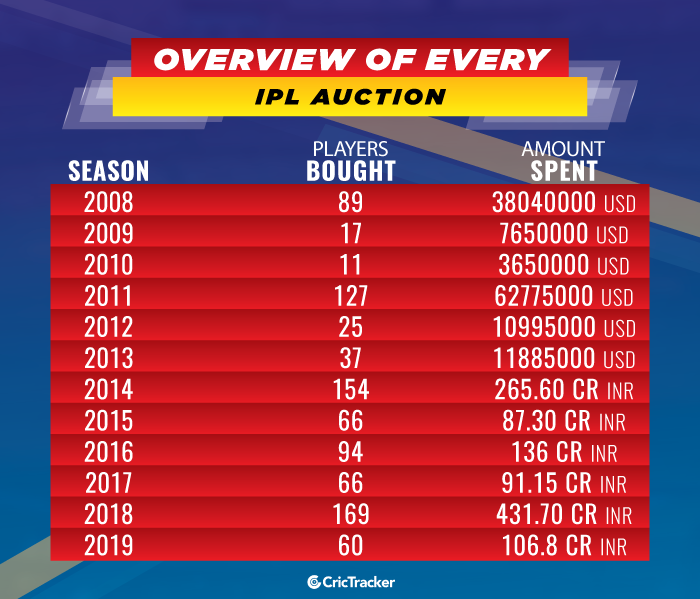 Here are we look at the numbers from all the IPL player auctions. 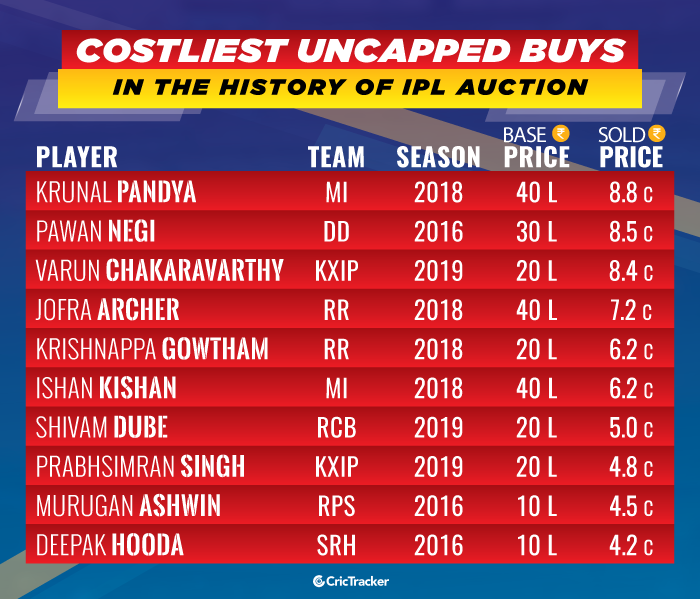 The Indian Premier League (IPL) player auction once again turned out to be unpredictable for the viewers and analyst with the signings the franchises made. The teams did not have much interest in the experienced players but instead went behind what they reckon as the young talents for the future. Some of the domestic workhorses were left dejected after going unsold. Performers from the local T20 leagues turned out to be millionaires. One such pick was Varun Chakaravarthy who turned a professional cricketer three years ago in his mid-20s. The mystery spinner from Tamil Nadu was sold to Kings XI Punjab for a whopping 8.4 crores which is 42 times his base price 20 Lakhs. 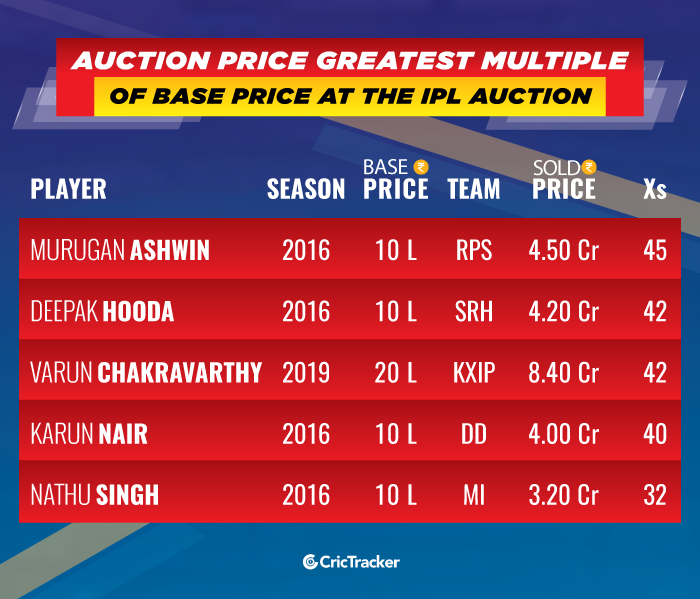 This is the joint 2nd greatest multiple of base price in the history of IPL auctions. Another mystery spinner from Tamil Nadu, Murugan Ashwin, went for 4.5 crores to RPS in 2016 from a base price of 20 Lakhs in 2016. Chakravarthy’s 8.4 crores is also the 3rd highest bid for an uncapped player in the IPL history. The highest is 8.8 crores for Krunal Pandya in the auction for 2018 season. 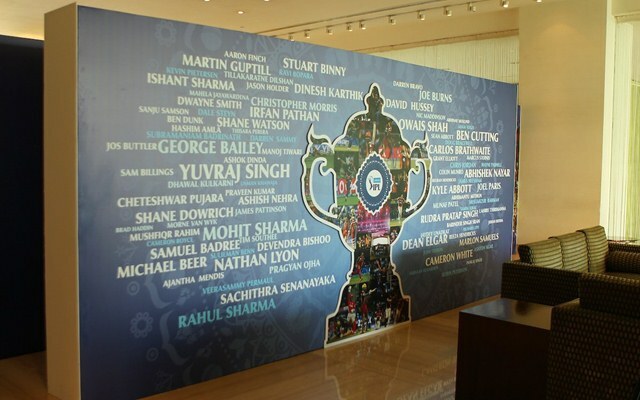 Mumbai Indians used their right to match card on their player. Shivam Dube and Prabhsimran Singh who were bought in the recent auction find themselves in the top 10 list. 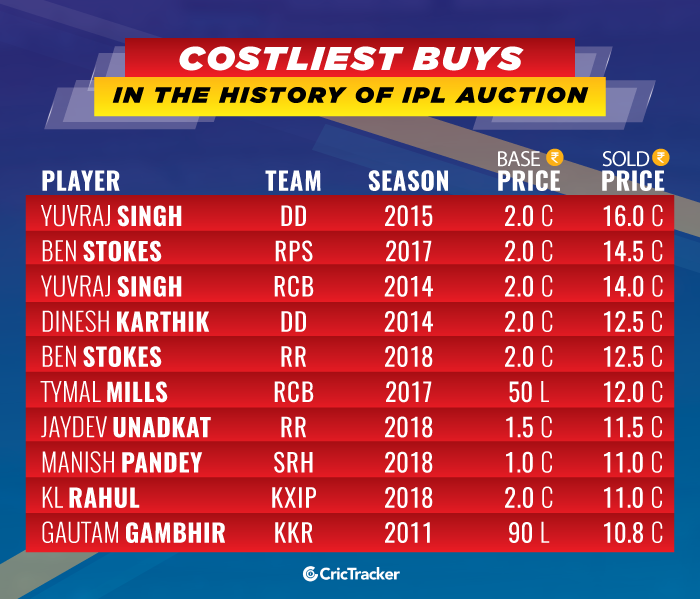 Chakaravarthy was the top buy in the auction for the 2019 season along with Jaydev Unadkat making it the first instance when an uncapped player was the top buy at an IPL auction. Yuvraj Singh, who holds the record of getting the highest bid in the IPL auction of 16 crores in the 2016 season, went unsold at first go this time. He, however, found a bid from Mumbai Indians at the last moments. This was the 6th time the former all-rounder was sold at the IPL auction and has been picked by a different franchise every time. Thus, he became the first player to be bought by six different teams at the auction. He now has earned approximately 48.1 crores by appearing in the IPL auctions which is by far the most for any player. The lion share of this came across 2014 and 2015 where he was sold for 14 crores and 16 crores respectively. 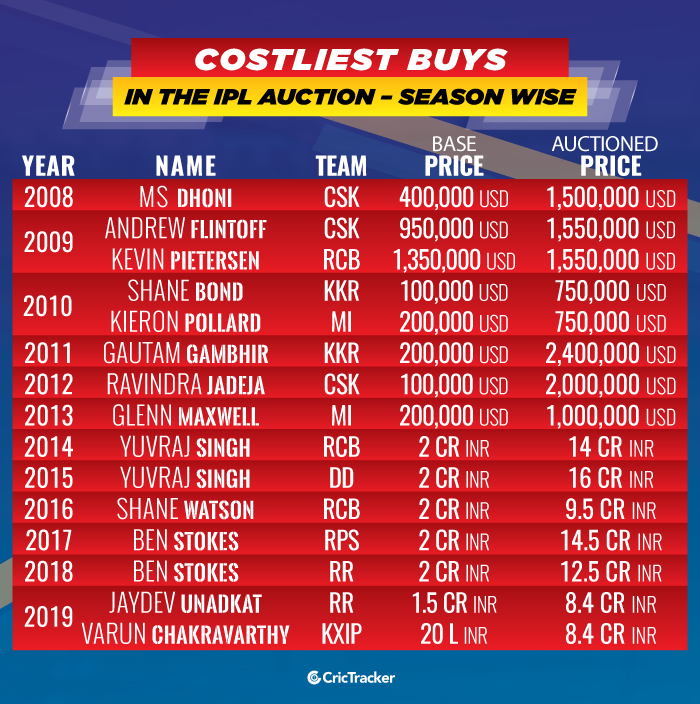 These two bids stand in the top three costliest buys in the IPL auction history. England all-rounder Ben Stokes earned 14.5 crores and 12.5 crores respectively in 2017 and 2018. His earnings of 27 crores are the most for an overseas player in the IPL auction. Way back in the IPL Auction for the 2011 season, the Kolkata Knight Riders spent 240 thousand USD to rope in Gautam Gambhir. This price would translate into 10.8 crores INR as per the USD-INR rate back then. 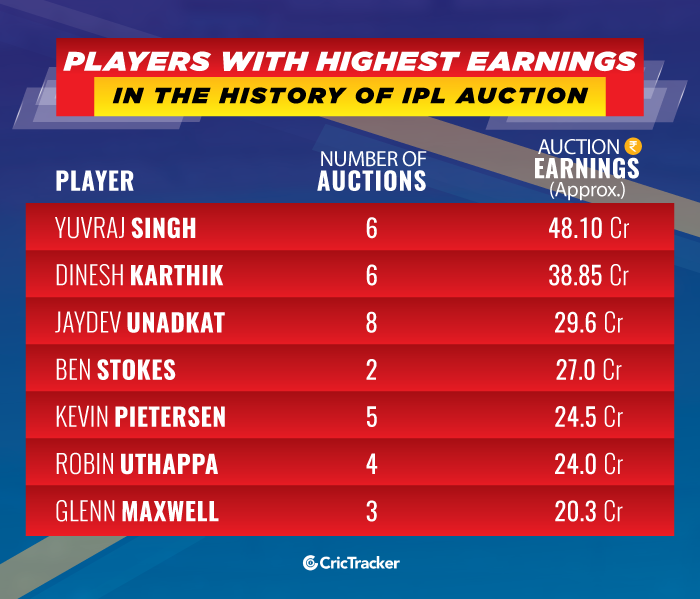 This is the 10th biggest purchase in the IPL auction history thus far. It should be considered that Gambhir turned out to be the biggest buy in the IPL history who actually helped the franchise relieve the dream of winning an IPL title. The left-hander led KKR to IPL titles in 2012 and also in 2014 after being retained.